You've heard of the movie, but have you eaten the delight? No? Oh are you in for a delicious summer treat! Fried green tomatoes are the perfect summer supper. They only use a few ingredients, they are inexpensive, and take no time at all to make! You are going to love this country staple! Let me show you how I make them. So what are green tomatoes you ask? Well, green tomatoes are simply tomatoes that haven't ripened yet. That's it! When heading to your local farm stand to buy these little green jewels, you will want to make sure that they are quite firm. To begin, you will want to slice the green tomatoes with a serrated knife. The thickness is purely a matter of taste. Some like them thin, some like them thick. However you like them is fine. After you have sliced them, lay them out on a paper towel and sprinkle them with salt on both sides. Let them sit for about 5-10 minutes to draw out all of the excess water. While you are waiting for the water to be drawn out of the tomatoes, prepare your breading station. I would usually use buttermilk for this, but I was out. An easy fix for that is to add a slash of white vinegar to your milk. It will have the same affect as buttermilk. Next add the yellow corn meal to the other dish. You can also you use flour here, if you prefer. Dip the tomatoes in the milk so that both sides are coated. Then dip them in the corn meal. Shake off the excess corn meal. Gently place them into a skillet with 1 inch of oil, that has been heated over medium/high heat. Let them cook for 3 minutes, until golden brown. There you have it! 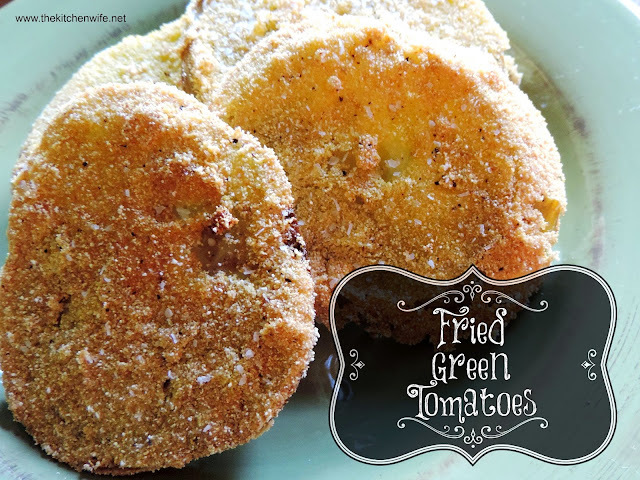 Beefy and crisp Fried Green Tomatoes! Trust me, these little beauties are quite filling and this is a great way to introduce your children to new vegetables! Can you say veggie nugget? I know you are going to love these summer jewels, so head out to your local farm stand and give these a try tonight! Preheat a skillet with 1 inch of oil in it over medium/high heat. Slice the tomato, with a serrated knife, to your desired thickness. Lay out on a paper towel and season with salt on both side. Allow the tomatoes to sit on the paper towel for 5-10 minutes to draw out the excess water. Dip the tomatoes in the buttermilk so that they are coated. Then put the tomatoes in the corn meal that has been seasoned with salt and pepper. Gently place in the hot pan of oil. Allow to fry for 3 minutes, until golden drown. Remove from grease, place on paper towel, and salt.